For all the behind-the-scenes changes–from directors Phil Lord and Chris Miller being replaced by Ron Howard to script changes–it’s a miracle Solo: A Star Wars Story ended up faring well. And with so many Star Wars films being produced, the question of whether each film is able to stand on its own and also be part of a whole universe is always on the brain. Suffice it to say that Solo: A Star Wars Story provides just the right kind of balance between a western and a heist movie, while also building a platform for character backstories and development. In a galaxy far, far away, Han (Alden Ehrenreich) is intent on escaping from the oppression on the planet he lives on and has his heart set on becoming a pilot. He’s in love with Qi’ra (Emilia Clarke) and they’re both more than ready to run away together and start a new life. However, all doesn’t go as planned and Han and Qi’ra are separated. Later, Han finds himself in the company of Beckett (Woody Harrelson) and Val (Thandie Newton), thieves working for the deadly and threatening Dryden Vos (Paul Bettany). When a job goes sour, Han must work alongside his new acquaintances to get the boss what he wants. His journey includes recruiting Lando Calrissian (Donald Glover) and his Millenium Falcon for the adventure. But amid the excitement of realizing his dreams and seeing Qi’ra again, he ends up in the middle of something much more dangerous than he ever anticipated. Solo has a lot of charm and that’s due in large part to the characters, each of whom are memorable and full of personality. In addition, Alden Ehrenreich’s Han is engaging and full of just the right amount of youthful optimism and naiveté that allows space for some personal growth that aligns with the film’s events. He’s suave without being arrogant and confident without being excessively boastful. He isn’t an exact replica of Harrison Ford’s Han and that’s refreshing since this movie takes place years before we meet the older version of him. The supporting cast is also fantastic. 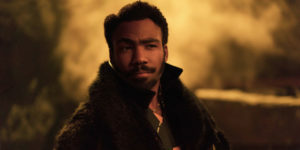 Donald Glover’s Lando is a particular standout. There’s a gleam in his eyes and he’s rightfully filled with suspicion. 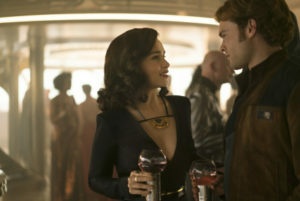 Emilia Clarke’s Qi’ra is content for a while to let Han believe that all will be ok, while also willing him to understand how much has also changed and what she’s been through in order to survive. Clarke and Ehrenreich have great chemistry and their scenes together are very sweet. Woody Harrelson is perfect in his role as an outlaw smuggler with advice to give. The story and action keep you engaged throughout and there’s plenty of fun balanced with good character beats. Does it ultimately add to the overall Star Wars universe? Kind of. Was it necessary? Maybe not, but it was at least refreshing to watch a story unfold that had only hints of a growing and powerful empire, while not having it be the center of the film. The tone wasn’t dark and not having to constantly see stormtroopers wander around was a nice change of pace. More than that, Solo felt more like we were witnessing different parts of the galaxy. There were different locations involved, different people, a few new planets. It felt like a world where people actually lived and interacted. So on that end, it was definitely far more dynamic than other films in the franchise. It also had plenty of comedic beats, but never went over the top. Solo was also very controlled storywise, and the one of the only shaky aspects is Han’s trajectory. His first goal was clear: Get a ship and go back to rescue Qi’ra. That changes along the way and by the end, it becomes more about being seen as a good man so as to set up his characterization in the other films. However many good things there are in the film, one of the downfalls, as with so many movies out there, is that it suffers from having only one woman in the cast full of men at any given time. It’s not a Solo issue per se, but it’s indicative of an industry that still meets the bare minimum when it comes to females in film. Thandie Newton and Emilia Clarke never interact and the former is barely even in the film, which explains why she was largely left out of the marketing of it. Moreover, the film does go on for about 15 minutes too long, with new developments happening one right after the other in the film’s final minutes that could have been a bit more spread out. 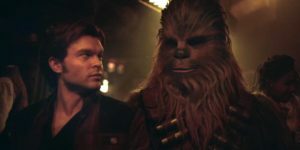 Ultimately, Solo: A Star Wars Story manages to still feel like it’s set in the Star Wars universe, but also stands alone and carries its own unique flair. While many may have been worried that the film would be boring, it’s anything but. With fantastic action sequences, a stellar cast and character dynamics, and a story you can get behind, Solo is very much worth the watch. With fantastic action sequences, a stellar cast and character dynamics, and a story you can get behind, "Solo: A Star Wars Story" is very much worth the watch.